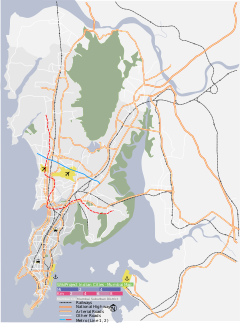 Chembur is a railway station on the Harbour Line of the Mumbai Suburban Railway network. It lies near Chembur Market. It has one train in the morning starting from this station. It has two platforms which serves North and South bound railway line. The Chembur monorail station is connected with a skywalk to the Chembur railway station. The Kurla - Chembur single line was built in 1906 for garbage trains. It was opened to passenger traffic in the year 1924. The Kurla-Mankhurd section which also contained Chembur was electrified in 1950 and suburban steam services were run on one track from 1951. The station provides noise indicators for the blind to help them spot where their compartment comes in. It does not have ramp for the differently mobile. The Station Master's Office has the First Aid Box. The station can be reached by road on both East and West side. ^ ' + val.created_at + '. "Mumbai monorail to be inaugurated today". NDTV.com. Retrieved 2 February 2014. ^ "All about Mumbai's monorail". Niti Central. Archived from the original on 3 February 2014. Retrieved 2 February 2014. ^ "History of Railways in India - Part 3". IRFCA. Retrieved 15 May 2010. ^ "History of Railways in India - Part 4". IRFCA. Retrieved 15 May 2010.